Buying, writing, and finally getting to the post office to send holiday cards to faraway friends and family can take a good chunk of time. If you’re a connoisseur of greeting cards, then you probably won’t need any help with the process. But if you’re like me—short on time and a bit of a holiday procrastinator—it’s helpful to have an easy and quick way to let people know you’re thinking of them this season. 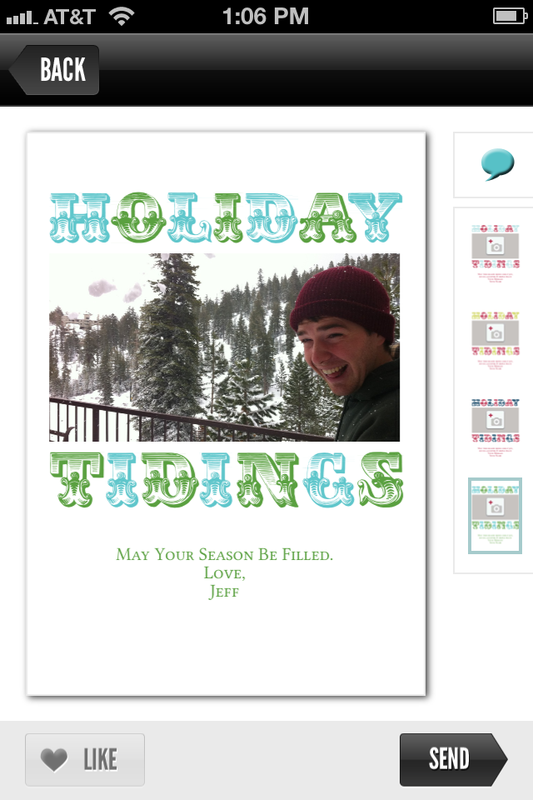 Sincerely’s Sincerely Ink app is made specifically for the holiday greeting card season, offering more than 30 Christmas, Hanukkah, and general cold-weather cards. The app has only flat, postcard-style options, but if you’re looking for cute and classy designs, Sincerely Ink offers some of the best. When you launch the app you’re taken to a virtual shelf that displays thumbnails of the card designs, which are organized into three tabs: Photo, Illustrated, and Saved. If you choose to use one of the photo card options, you will be able to resize your own image, as well as apply a black and white or sepia filter. Unfortunately it’s not possible to flip or rotate your photo within the app, so you will need to do this elsewhere before using the photo in Sincerely Ink. You can edit the text on the front and back of the card, though you won’t be able to change the font—Sincerely Ink automatically uses the font in the card’s design. A Fullscreen button lets you preview your card to make sure it’s exactly what you want. Once you’re done you can easily input multiple recipients either manually or by choosing contacts from your Address Book, and Sincerely Ink will send the cards directly to the people on your list for you. Paying for the purchase is incredibly simple: You can either use a credit card at checkout, or purchase credits from the Account settings. Requires iPhone, iPod touch, or iPad running iOS 4.0 or later. Price: $2 per card (U.S. shipping only). Bulk discounts available, from $1.69 per card. Red Stamp is perfect for those who want to send their friends and family minimalist cards for every occasion. The holiday section includes tons of photo and non-photo postcard options, separated into seven categories: Christmas, Hanukkah, Holiday Card, Holiday Party, Holiday Thanks (Gift), Holiday Thanks (Party/Event), and Thanksgiving—this app has you covered all season long, and then some. 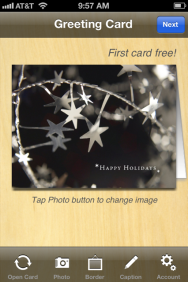 (Most of the card designs are free, though Red Stamp also offers premium designs that cost an additional dollar.) Card designs often offer different color themes, so if you’re not really a red-and-green person, you’ll have other colors to choose from. What makes Red Stamp stand out among other card-making apps are its photo layouts: Depending on the design, you’re able to add up to four different images on a single card. So if you don’t have a perfect group shot, you can combine portraits of everyone to create a nice photo collage. You can add a short message on the front of the card, but you won’t be able to write anything long on the back. On the plus side, you can easily share the card via Facebook, Twitter, email, or text—a great feature if you want to limit the number of physical cards you send. The app will, however, send the card by mail to up to to 189 recipients, so even if you have a long list, Red Stamp will be able to handle it. Price: $2 per card (U.S. shipping only). Bulk discounts available from $1. 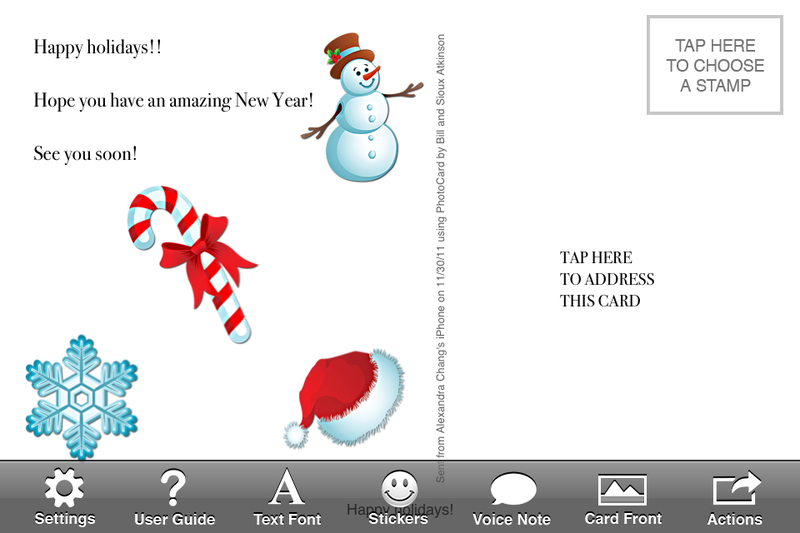 NSN Solution’s SnapShot Greeting Card is one of the few apps that lets you create and send traditional folded cards (the company also has a postcard-making app called SnapShot Holiday Postcard). You even get your first card for free! The front of the card features a full-page photo, which you can choose from your photo library or the app’s built-in artwork; you can also take a photo from within the app. The built-in artwork includes more than two dozen holiday images with related greetings. You can also add a themed border and a customized caption, so if you use your own image, you will be able to add more holiday flair to it. The app lets you choose between 11 fonts for the caption on the front of the card, but oddly, does not offer any font options for the message inside the card. Once you’re finished, you can easily add recipients manually or by accessing your Address Book; SnapShot will send all of the cards directly to your contacts at once. In order to purchase cards, you need to buy credits through your Account settings first. It’s slightly inconvenient that you have to do this in a separate area from the checkout, but the process is simple enough to follow. Requires iPhone, iPod touch, or iPad running iOS 3.0 or later. Price: $4 per card (U.S. shipping), $6 per card (International shipping). Bulk discounts available, from $1.60 per card (U.S. shipping). Bill Atkinson Photography’s PhotoCard app is similar to Sincerely Ink and Red Stamp, with some unique differences. 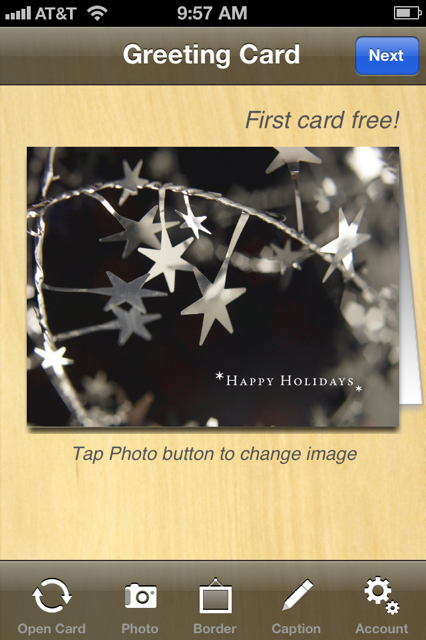 Like most other card-making apps, you can create and send postcards to multiple recipients. But with this app, the photograph takes center stage—you can’t add any text or borders to the image on the front of the postcard. (You can, however, add a caption that will be printed on the back of the card). The back of the card is a different, and more embellished, story. Price: $1.90 per card (U.S. shipping), $3 per card (International shipping). Bulk discounts available, from $1.50 per card (U.S. shipping). Made by the same company as Sincerely Ink, Postagram is a popular postcard making app that complements Instagram. 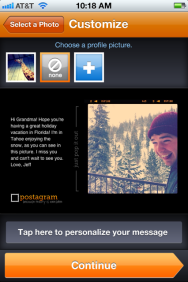 You aren’t actually limited to photos you’ve posted on Instagram—the app lets you pull photos from your Camera Roll and Facebook—but any image you choose for the postcard will be cropped to square format. You can then add a short message (180 characters max) and a profile picture that will be printed next to your name. What makes Postagram cards unique is the ability to pop the image out from the postcard. So even after the holidays pass, and the message on your card is outdated, your cousin across the country will still have a cute, square photo to hang on her refrigerator all year long. You can send Postagrams to multiple recipients at once; choose contacts from your Address Book or enter them manually. Requires an iPhone, iPod touch, or iPad running iOS 4.0 or later. AnguiriaLab’s Postino app has similar features as SnapShot greeting card, but with the same format as Bill Atkinson Photography’s PhotoCard. 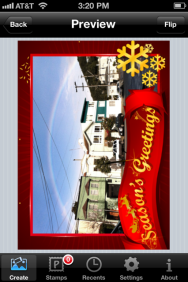 You can only add one photo to the front of your postcard, and there are no card themes or designs to choose from. 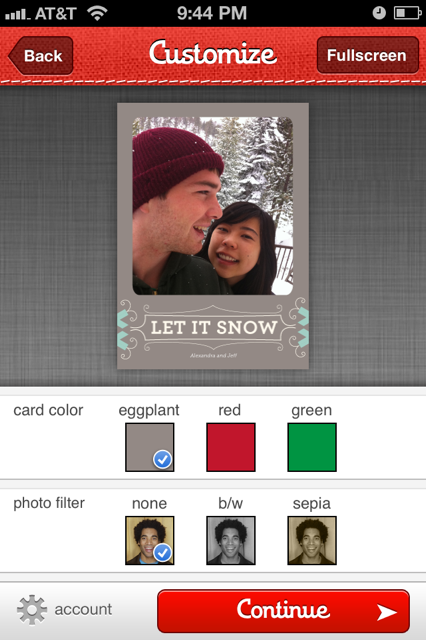 Instead, you can decorate your card with holiday-themed borders—there are 16 included in the app. They are somewhat reminiscent of Microsoft Word graphic art, but some of the borders are passably cute so that they do add something to the card. Requires an iPhone, iPod touch, or iPad running iOS 3.0 or later. Price: $2 per card (U.S. shipping only). Bulk discounts available, from $1.60 per card.